Scott received a Masters of Fine Art in Ceramics at Ohio State University in 1989. His sculpture has been exhibited in galleries and museums nationwide. He was a prototype designer for Bath and Body Works and White Barn Candle Company for 7 years, and has been working with clay since 1979. Scott is currently co-owner of Red Dot Gallery, and is on the Ceramics Monthly Advisory Board, a national ceramics publication. Beginning Students will learn techniques for throwing basic forms (bowls, plates, mugs, pitchers etc.) on the potter's wheel as well as hand-building techniques (pinch, coil, and slab-building) if desired. For intermediate and advanced students, I will help you refine your existing skills and expand your possibilities of form on and off of the wheel. Classes are ongoing and students can start at any time if a time slot is available. Availability is first come, first serve. I teach beginners and advanced students together with a 8 student per class limit. Price is $175 per 6 weeks, and students must commit to 6 consecutive class sessions meeting at the same time every week. Classes are only for adults 18 and over. 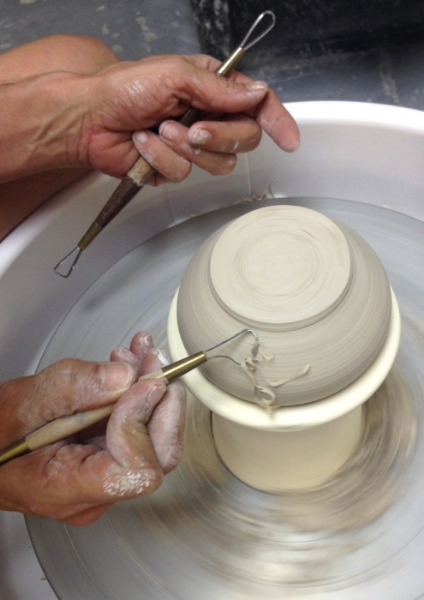 Materials (clay and glaze) are not included in the class price which costs each student approximately $50, and I provide a list and locations to purchase supplies. Any missed classes must be made up within the six session period. Non-refundable class Gift Certificates are available.